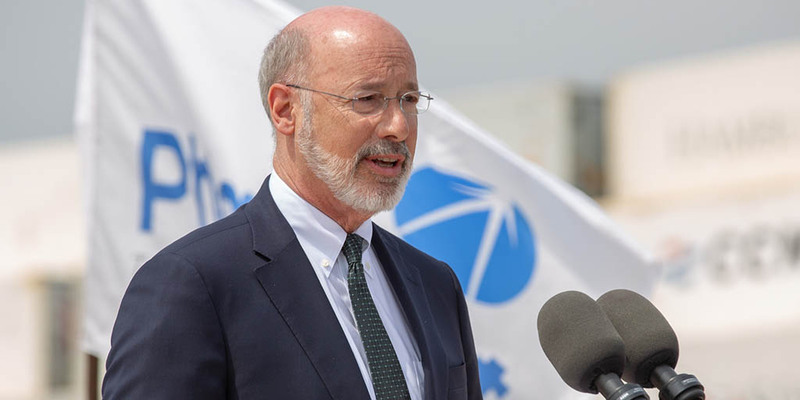 Harrisburg, PA – Governor Tom Wolf announced the latest round of Redevelopment Assistance Capital Program allocations, which seek to bolster important projects statewide for community redevelopment, workforce development, and business and non-profit expansion. “These projects reinforce my administration’s commitment to helping more Pennsylvania companies expand and grow, more Pennsylvania communities transform and revitalize, and more Pennsylvanians having the necessary skills and opportunities for higher-paying jobs,” Governor Wolf said. The full list of projects receiving matching funds is below. Ironworkers Training Center Expansion ($750,000): This project will entail adding new construction of over 7300 sq. ft. in addition to the total renovation of the existing 7150 sq. ft. training center. This project will modernize the training space, give more hands-on training areas, upgrade and modernize the AWS accredited weld shop and testing facility, and as a result, double the Ironworkers’ training capacity. Wilkinsburg Train Station Restoration ($1.5 million): This project will complete the interior restoration of the historic Wilkinsburg Train Station. The scope of work includes building systems, interior restoration at the main level and the side wings, minor interior work at the lower levels, restrooms on both levels, elevator addition, and an entrance addition and ramp to the pedestrian tunnel that extends under the East Busway and railroad trestles. Gables Building Redevelopment ($2.5 million): The Gable’s building is Downtown Altoona’s marquis building. The project will include the following: removing the brick façade from the exterior of the buildings; restoring the original exterior including all windows; roof repairs; interior repairs due to façade-windows; electrical mods due to façade removal; repairing, repointing exposed brick. With the stated improvements which will result in the daylighting of the entire building, approximately 58,000 square feet of new available office space could be introduced into the market. Paxton Creek Re-Channelization ($2 million): The grant will achieve the initial stage of removing multiple bridges and buildings that are channel restrictions to allow for flood mitigation and additional redevelopment. The components of this phase of the project cannot be funded with other state programs. Samter Building Redevelopment ($800,000): Rehabilitation of the former five-story department store building into 24 one and two-bedroom apartments with modern layouts and amenities. Funds will be used for construction of the project and specifically the facade and building envelop. Restoration is needed for windows and facade elements that goes beyond what is financially viable in the market place. Mill at Easton Phase II ($2 million): TCH Development (TCH), is advancing a two-phased redevelopment project at a blighted, former industrial silk mill site on the south side of the City of Easton. The RACP grant request will be directed at the Project’s Phase II, a 1.74-acre commercial redevelopment effort, will feature a dynamic mix of commercial uses, including 38,500 square feet of retail, a medical office/clinic, a restaurant and a grocery store, as the site is located in a food desert. The RACP funds will support the necessary Phase II site preparation and the construction of its commercial uses. Philabundance Community Kitchen 2.0 ($2 million): Philabundance will use the funds to construct a 19,960 sq. ft. free-standing facility that will include 10,000 sf of space for a production and a training kitchen, both USDA certified; office and classroom space; locker rooms; ample storage and refrigeration; and flexible community space. Awarded funds will be used for qualified planning and construction costs related to general requirements plumbing, concrete, masonry, HVAC, fire suppression, finishes, electric, communications, and utility lines. Community Medical Care and Wellness Campus in Kensington ($1 million): During Phase I of this project, Esperanza will renovate a four-story, 35,000 square foot former bank building at 861-879 E. Allegheny Ave., acquired 11/2016 to expand our medical care facilities by 33 percent (from 6 to 8 medical hubs) and dental clinic by 33 percent (from 6 to 8 operatories). A new parking structure with 100-125 spaces will also be built. Although not part of this application, Phase II will involve construction of a new community center with a gymnasium, classrooms, kitchen and rooftop garden, and Phase III involves renovation of several residential lots and houses adjacent to the campus, to be used for parking, green space and to provide non-clinical ancillary services. Cristo Rey Philadelphia High School Campus ($2.5 million): Cristo Rey Philadelphia will build its new school campus at 1717 W. Allegheny Avenue in the Tioga neighborhood of Philadelphia. The campus will be approximately 100,000 SF – 54,570 SF in a renovated historic factory and 47,785 SF of new construction. RACP funds would be used to support the construction costs to restore and repurpose this crumbling, historic structure. Silk Mill Business Expansion Initiative ($1 million): The Silk Mill Expansion Project will involve the renovation of the Annex Building (Warehouse) and the connectivity between all Silk Mill properties on the Silk Mill Campus located in Hawley Borough, Wayne County. The York Plan 2.0 Innovation District ($6 million): This project is built on strategic partnerships with experts in Innovation District creation, local real estate developers, and high-growth robotics and technology companies. The partners hold an option on Tract 1 of the NW Triangle and are in the design stage of building a 240,000 sq. ft., 5-phase structure. Securing RACP funding would allow Phases 1 & 2 to commence, pre-leasing to progress to future phases, and EB-5 investments to be secured. Once completed, the site will house American-made robotic device development and assembly, prototype design workshops, and office and lab space.